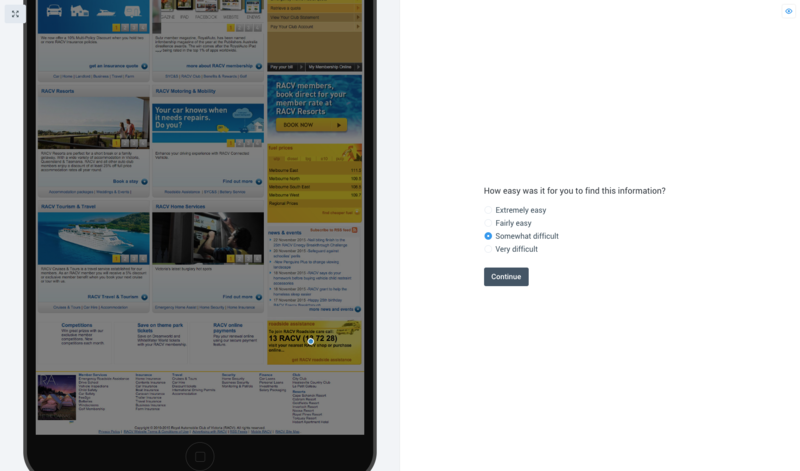 This question encapsulates everything that user testing is about. Making sure that users can find what they need is a primary focus for usability practitioners the world over. Running a single first click test can give you a good idea of the performance of your design. Just upload a screenshot of the page in question, and set up a task that asks users to find a specific element. Asking a question about the perceived effort of completing the task gives the results an extra dimension of insight. Analyzing the time it takes a test participant to click on the intended target element is interesting, but it’s much more interesting when testing different versions of your interface in a variation set. When it comes to defining success for this kind of task, there are no hard and fast numbers to live by, because every site and use case is different. In the sample test, participants clicked in four different areas to complete the task. Ideally, there’s a single concentration of clicks, or maybe two — but in this case, all four would constitute ‘successful’ clicks. Each highlighted area has a relatively high average time-to-click. 15 seconds is borderline, but 30+ seconds is definitely too long for a simple task. However, the real red flag is that the perceived effort is either ‘Somewhat difficult’ or ‘Very difficult’ for 74% of participants. This shows that the design is making participants work too hard to find a phone number. The good news is that these results reveal an opportunity to markedly improve the UX of the site, in a tangible, measurable way.